The winter steelhead are yet to show into the upper Rogue River. Now, that doesn’t mean that they are not there. Just few, far and in between. I have heard that near eleven have been counted into the Cole M. Rivers hatchery on the upper Rogue River. Probably the number is higher by now. I got out the other day to see if I could find an early winter. I carried three rods, the Spey, switch rod and light little pack rod. The Longfellow pack rod breaks down to mere 18 inch sections. Hardly noticeable when stashed in the backpack, and very opportune to have when the midday trout hatches come off. Initially I fished hard with the stout, longer steelhead rods. Not even a scratch coming from some good locations. I fished Carpetbaggers, G.R. Hare’s Ears, and even an Orange Heron on the Spey rod. With the Rogue River’s flow down to 1450 CFS, some winter steelhead action should have been forthcoming. Even talked to a knowledgeable flyfishing regular who had started early at 6:00 AM. “Nothing to report,” he said, “And nothing much happening at all lately!” I watched for a while a couple other bankers (gear guys) who fared no better. So, there’s not much movement yet. The winter fish are still staged in lower reaches of the river. Gradually the morning darkened with the hint of rain. I noticed the first few early rises from a sloping, long riffle. Some of them were good. A small, dark mayfly was observed flying in the warming air. I put together the small, trout rod. Soon splashy rise forms were increasing on the riffle. I don’t like to let these February hatches go by unsampled. There are some good size native trout in the Rogue River. I recall one incident where I was at the right place at the right time. Splashy rises dominated a small, narrow run. I tied a size 12 Grizzly Wulff on to the leader of the 5/6 weight flyrod. The first cutthroat I caught was a good 14 inch fish. The rises continued. I then proceeded to catch and release nine cutthroat up to 16 inch long. The tenth fish was a 24 inch summer steelhead. The next three fish caught were all summer steelhead! 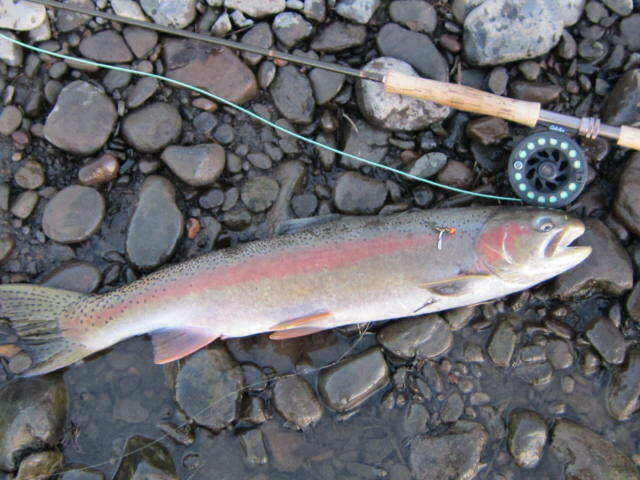 Though the steelhead were all spawned out downrunners, the action was fun and rememberable. Yes, these February hatches can provide surprises. This day no real whoppers came to my dry fly. I couldn’t quite “match the hatch” as my size #12 bluewing olive fly was a couple sizes to large. Many floats through the riffle went untouched. Every now and again I got a good rise, take and hook up. I did notice a few larger, dark, slate wing naturals scattered in the main hatch. Some of the fish were a good 12 to 13 inch long. On the light flyrod they put up a good, strong fight often with many an airborn leap. Couldn’t resist keeping three hatchery marked fish for a fish fry. Saute of Trout Amandine. 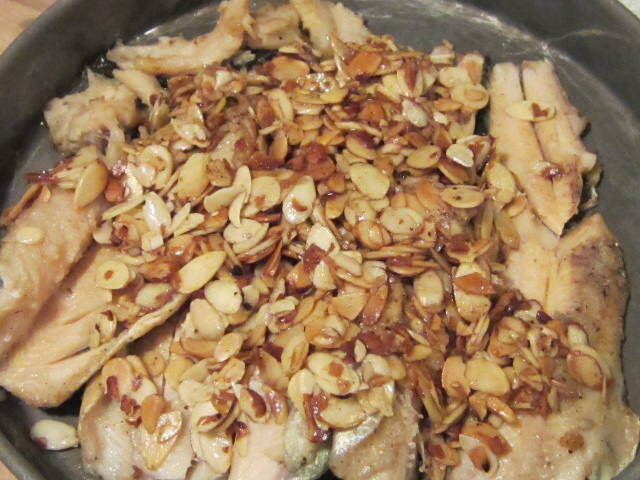 Blanched almond slivers bring a crunchy contrast to the soft, mild trout. 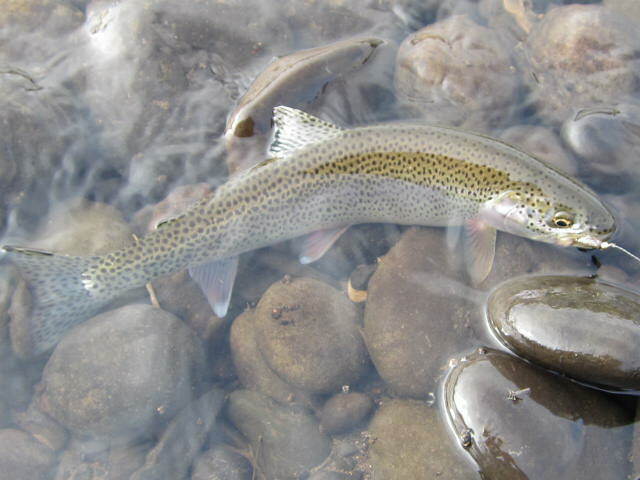 There are still a few good summer steelhead showing in catchs on the upper Rogue River, and with the early February warm up, the trout and cutthroat trout have become more active. I connected with this good size Rogue River steelhead the other evening casting the orange beadhead Carpetbagger Nymph (AKA the Brownbagger). This February Rogue River fish came to the orange beadhead Brownbagger. 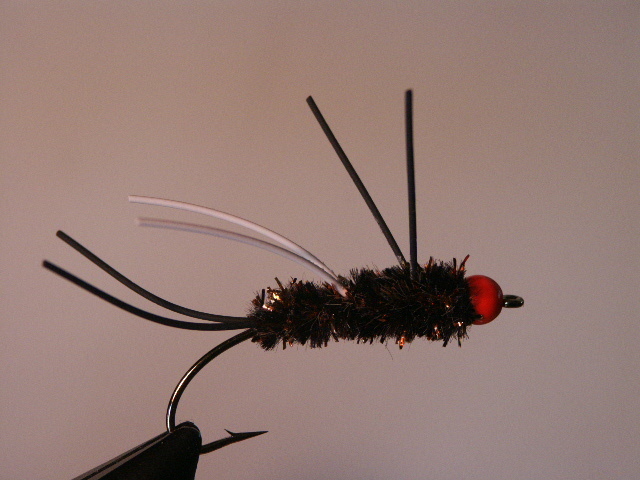 The orange egghead Brownbagger is a good pattern to use now on the upper Rogue River. I also had on my leader a G.R. Hare’s Ear Nymph as the second fly. So given the choice the steelhead went for that glint of orange on the larger fly. Not surprisingly several good size cutthroat trout have also hammered the Brownbagger pattern. The smaller G.R. Hare’s Ear pattern has been hooking it’s fair share of trout and smaller cutthroat. I noticed the trout rising actively to a hatch the other day. February insect activity! I sometimes try to match the hatch with a dry fly like a small BWO, Humpy or Adams. Fun when you encounter the right situation, and surprising when you hook up with something larger than a mere smote. This requires changing your tippet size accordingly to the small dry fly size. Not really something I want to do when fishing a large Spey rod or even the switch stick. Most often I’ll just simply add a appropriate dropper, a small G.R. Hare’s Ear or Prince Nymph and swing my flies through the riffle where the hatch is apparent. That way I’m still covered if a larger steelhead is present and decides to take. Hopefully, with a steelhead, it will be the larger fly with stronger leader that is taken! A nice cutthroat trout. Note the BWO natural on the bottom rock. A new pursuit. A new passion. After years of observing plentiful waterfowl along the Rogue River I became interested in hunting them. Three years ago I began carrying a light, single-shot shotgun along on fall steelhead flyfishing adventures along the river. The results were good. Despite the single-shot refusing to fire during sub-freezing weather, I got a few ducks. The next year I upgraded to a CZ Mallard o/u 12 gauge. The over & under shot straight and did not fail during freezing conditions. Again I put a few ducks in the freezer. This year I got my first pump, and even went so far as to devote some of my time on the river to just duck hunting. Lets just say that waterfowling can grow on one and become an addiction just as much as flyfishing for Rogue River steelhead. Early September and I start watching the slack water along the Rogue River. A grey heron takes flight. In anticipation of the season, I savor each mallard I glimpse along the river through the green of late summer. Dove hunts on the Denman WA offer opportunity to scout the ponds and wetlands it offers. A fellow September fly fisherman interupts my early scouting of a Rogue River mud flat. Scaring away the ducks! Waterfowl dreams leads to waterfowl art. Finally the season arrives. Early ducks usually include the wood duck a year round resident. Another early duck is the widgeon, but generally you will see more mallards in the early season. Here’s a view most mallard hunters dream of. A pair of mallards with the drake in the lead. With so many species of waterfowl there are always new first. My first spoonie. Here is the look a goose hunter would dream of. Waterfowl decoys can come in handy. I often set a small spread of teal and mallard. A layout blind offers concealment. Though light weight, the bulk of carrying one around limits it’s use to specific sites. Late season brings plentiful buffleheads. Late season conditions often consist of low water and ice. Ice on the mudflat can mean good shooting opportunities for the fast green winged teal. This year the mallard were snubbing their bills at me. Late season ice on the creek left little open water. Sometimes this helps concentrate the ducks. I finally get my mallard drake under late season conditions. A small flight of teal appear against a cold, January sky.